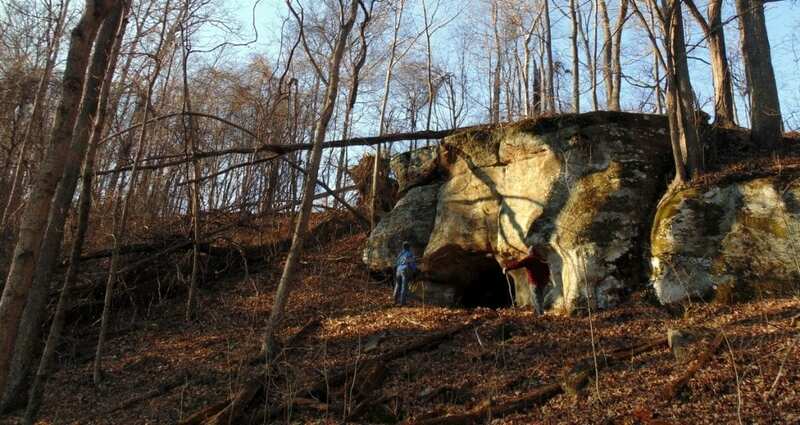 Explorers visit the Indian Cave in the Lewis Wetzel Wildlife Management Area. Photo courtesy David Sibray. The 13,590-acre Lewis Wetzel Wildlife Management Area (WMA) ranges across a forest of oak and hickory and cove hardwood that climb moderate and steep slopes from the banks of the south fork of Fishing Creek. Its namesake, Lewis Wetzel, was an explorer and frontiersman renowned for his violent interactions with the Shawnee and others who named him “Death Wind.” Wetzel is buried near the Palace of Gold near Wheeling, West Virginia, in Marshall County. Game traditionally hunted in the management area include deer, grouse, squirrel, raccoon, and turkey. Trout and bass are the principal fish taken in the south fork of Fishing Creek, which is stocked with trout February until May. Many wells and natural gas pipelines operate in the area. Twenty tent and trailer campsites and a 100-yard shooting range and Class-Q hunter-access road have been developed at the facility. Directions: The Lewis Wetzel Wildlife Management Area is located in southern Wetzel County, western Tyler County, and northern Doddridge County. The management area can be accessed by highway WV-20 at Jacksonburg, WV, three miles southweast of Pine Grove, WV, and four miles northwest of Smithfield, WV. The Lantz Farm and Nature Preserve Wildlife Management Area is located adjacent to the northern reaches of the Lewis Wetzel facility at Jacksonburg. The area is located on CR-13, approximately 14 miles east of its intersection with WV-18. The Lewis Wetzel WMA is managed by the W.Va. Division of Natural Resources. It was formerly known as the Lewis Wetzel Public Hunting & Fishing Area. Prehistoric hunters long roamed the woodlands in the present-day Lewis Wetzel Wildlife Management Area. The camped in a cave on a ridge upon which they also inscribed images of animals. Further information on lodging, dining, and recreation in Lewis Wetzel Wildlife Management Area may be found in our guide to travel in the Mid-Ohio Valley Region, in northern West Virginia, in which the management area is located.